Institutional Principles for Catholic Identity and Mission Assessment: A Best Practices Guide assists institutions in understanding assessment domains unique to Catholic education. It is divided into 10 domains commonly expressed in the mission statements of Catholic colleges and universities (see below). Each domain is defined by a Guiding Principle, a brief Discussion on the background supporting the principle, a set of Guiding Questions to facilitate institutional discussion related to the domain, and a list of possible Indicators to assess evidence in that domain. Institutional Principles also provides additional references and resources to enrich institutional discussions. Purchase in packages of 10 to share the Best Practices Guide across your campus and save money! 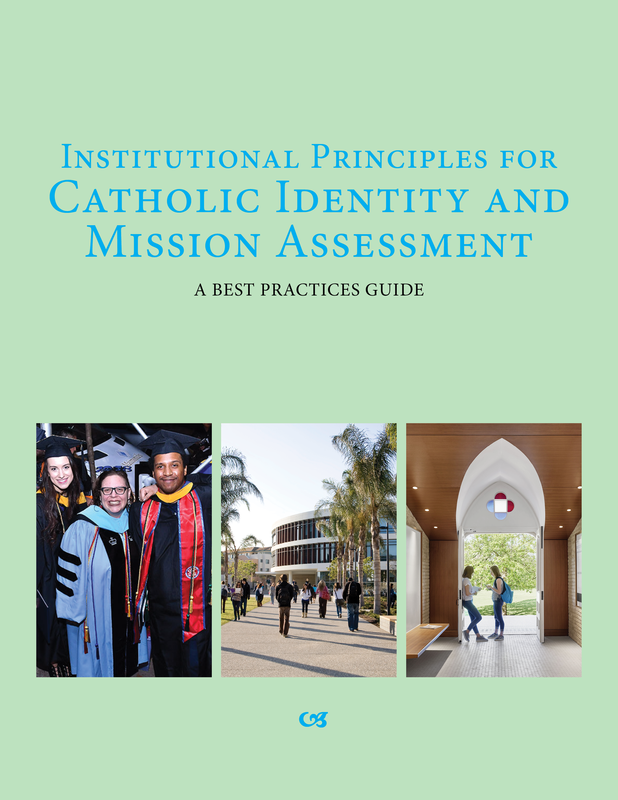 Although not necessary, it is considered optimal to use Institutional Principles as a best practices guide in conjunction with the Catholic Mission and Identity Assessment (CIMA) student survey tool. The CIMA Student Survey is an assessment instrument to understand student perception of mission and to determine effectiveness of institutional practices both in and out of the classroom, providing measurable indicators of student experiences with and understanding of the Catholic Intellectual Tradition; Catholic Social Teaching; Leadership, Service, and Vocation; the Climate for non-Catholics; Catholic Moral Teaching; Religious Beliefs and Values; and Religious Practices, along with demographic and background information for the students participating in the survey. Principle: The institution publicly acknowledges its Catholic identity in its mission statement and other documents and communicates this commitment both internally and externally, demonstrating the practical implications and benefits of its Catholic identity. Principle: The institution’s administrative leadership and governance structure are informed by the Catholic identity and mission to create unity of purpose. Principle: The institution advances students with an academic curriculum and specific mission-related courses that provide opportunities to learn about the principles and values common to Catholic teaching that cross disciplines and fields of study. Principle: The institution has faculty members who exemplify and embody commitment to advancing the Catholic mission and identity of the institution in their teaching, student interactions, and within their professional and disciplinary expertise and scholarship. Principle: The institution offers a holistic approach to student life and co-curricular learning that supports the personal, moral, ethical, religious, and spiritual development of students. Principle: The institution provides access to educational opportunities consonant with the uniqueness of its mission by assuring that all students have the support needed to matriculate and to achieve success. Principle: The institution provides programs, research, and resources that support Church social teachings and evangelization both locally, nationally and in the global community by encouraging discussion of faith issues, engaging culture, and promoting faith involvement on the part of its students, faculty and staff. Principle: The institution has staff across all operating units who create an environment that embodies the Catholic mission and identity of the institution. Principle: The leadership directs institutional resources as a just and prudent steward who seeks to advance an organizational culture reflective of the institution’s particular mission and charism by applying the principles and values of Catholic Social Teaching. Institutional Principles for Catholic Identity and Mission Assessment: A Best Practices Guide is available for purchase in the ACCU store. A free copy will be provided to all institutions that sign up for the CIMA surveys.